Herbert Samuel Goodland was born in Yeovil in 1877, the eldest child of railway signalman, later inspector, Edward Goodland (b1854, Ilton) and Elizabeth née Bishop (b1854, Yeovil). Edward and Elizabeth were to have six children; Herbert, Ethel (1880-1968). Ernest (b1882), May (b1885), Arthur (b1887) and Daisy (b1890). By 1880 the family had moved to Devon, where Edward and Elizabeth's first daughter Ethel was born and by the time of the 1881 census they were living at Halberton, Devon. By 1891 they were living at Bedminster, Bristol, having already spent a few years living at Uphill, Somerset. By 1901 Herbert had left home and was lodging in Cardiff, Wales, where he worked as a guard for the Great Western Railway Company. In the summer of 1902 Herbert married Edna Reece at Cardiff. They were to have three children; Edna May (b1903, Cardiff), Lily (b1904, Cardiff) and Herbert Edward (b1910, Bristol). In the 1911 census Herbert, Edna and their children were living at 38 Sandback Road, Brislington, Bristol, where Herbert worked as a warehouseman at an oil cake works. As far as a military career is concerned, it would appear that Herbert enlisted at Marlborough, Wiltshire. Initially he was a Private in the Northampton Regiment. His Service Number 6872 suggesting he enlisted in August 1916. 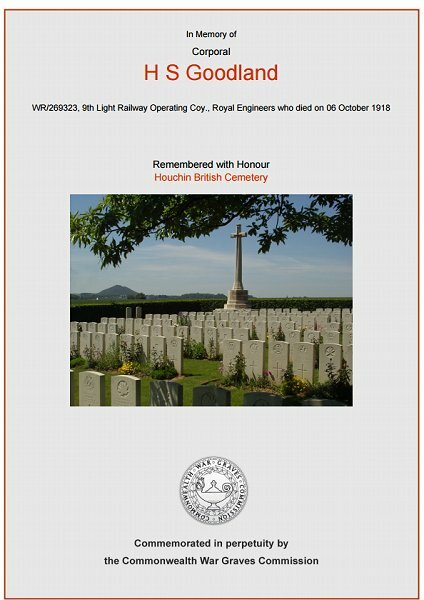 Bearing in mind his railway background however, it is not surprising that he was transferred the 9th Light Railway Operating Company of the Railway Battalion of the Royal Engineers. His transfer probably occurred when this Company was formed at Longmoor on 12 March 1917. During the Great War extensive use was made of narrow gauge light railways which used troops, horse and mules, as well as engines, to move munitions to forward positions. They were also used to evacuate wounded soldiers from battlefield dressing stations to a Casualty Clearing Station (CCS) further behind the lines. In October 1914, the Railway Executive Committee in England had formed a Sub-Committee for Recruiting. Very large numbers of the employees of British railway companies were then volunteering for military service and the men for RE Railway units were selected from them. By the end of 1917, out of 180,000 enlistments from English railway companies, about 40,000 were serving in RE Railway units, including Herbert Goodland. Each Light Railway Operating Company consisted of approximately 200 men, in a number of trades: Drivers, Brakesmen, Guards, Wagon Repairers, Repair Shop Engineers, Traffic Controllers and Storesmen. There were few officers among this number. The job of this type of Company was to run the trains with the tracks being laid by RE Railway Construction Companies - often with the assistance of whatever Labour Corps Company or 'resting' infantry were at hand. Because Light Railway Operating Companies operated across the Western Front it is not possible to determine where Herbert fought. He died on 6 October 1918, by which time he held the rank of Corporal. He was aged 41. 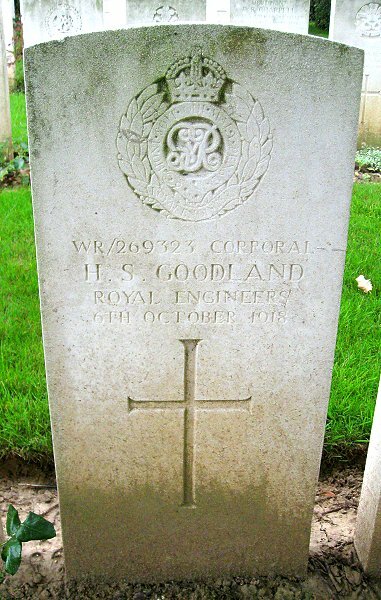 Herbert Goodland was buried in Houchin British Cemetery, Pas de Calais, France, Grave III.C.30. His name was added to the War Memorial in the Borough in 2018. The Commonwealth War Graves Commission certificate in memory of Herbert Goodland.